Silver Hatfield Marlin, born March 2, 1923, passed away January 3, 2019 in the comfort of her home with her daughter by her side. 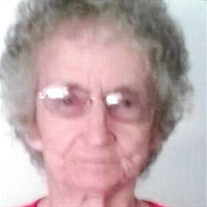 She was preceded in death by her husband; George Cecil Marlin, daughters; JoAnn Marlin & Rita Marlin, son; Rawlin Marlin, grandsons; Richard Marlin & Joseph McDonald, & 8 brothers & sisters. She is survived by her son & daughter in law; Chuck & Lennie Marlin of Sanford, FL, daughter; Joyce Jones of Bean Station, sister; Ruby Hatfield of Illinois. Special thanks to her caregiver Tina. She was the daughter of Hobart & Mattie Hatfield of Sneedville, TN. Silver was a lifelong Christian & proud member of Landmark Church of God. Rest in Heavenly peace my sweet Mother. Receiving of friends & family will be Monday, January 7 from 1:00pm -2:00pm at Mayes Mortuary, funeral services will follow at 2pm with Rev. Ray Pratt officiating. Interment will be in Hamblen Memory Gardens.